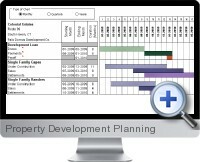 Property Development Planning for Excel (On Schedule) is a unique and powerful Excel tool for professional real estate developers planning land and housing subdivisions, condominium or construction projects. Property Development Planning for Excel builds a month by month estimate of construction costs, development costs, development loan utilization and repayment, project absorption, partnership distributions and more. The Excel template is also an ideal solution for analyzing incomplete, abandoned or foreclosed property development projects and to evaluate the specifics of a profitable acquisition. Define the project time line up to 120 months. Define up to 8 user defined unit types. Detailed analysis to handle and report on multiple investment partners. Define listings of hard costs and soft costs and include user definable categories. Project Executive Summary Report: A one page snapshot of key figures with graphs of annual revenue and costs. Partner Executive Summary Report: A quick view of the partner contribution and return with pie chart of equity contributions. Advanced user interface to make data entry easier and error free. Switch between US and metric measurements and change currency to Euro or other. Select monthly, quarterly or annual view of Gantt chart and graphs. Automatically download the latest updated version. Display of selected printer on Print Reports dialog. Comprehensive user guide and cell notes. Includes detailed user guide and free technical support.